In a world of chaos and distractions, Rosemarie seeks to render a quieter world that connects with and welcomes viewers into her paintings for enjoyment, inspiration and calm reflection. Nature and nature’s light are the stage and set-up for her subjects and themes to behold its beauty, offer hope and respite for healing, and reminisce in comforts. Her oil landscapes, still life and genre scenes are painted on-site “en plein air” from the ledge of a seascape, a meadow, a European rooftop, or by the studio window illuminated by natural light so to achieve a more truthful likeness and atmosphere while offering a scene of reality or from imagination. Rosemarie longed to learn to paint like the masters from the early age of 8 when she was introduced to the MFA. 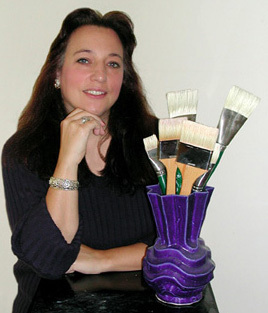 Her business college degree from UMass along with more graduate studies at BC was her admission ticket to enter into the lucrative commercial design, advertising and art consulting world which reset her path in the fine art direction — moving on to soak up every studio art class in graphic design, painting and illustration at local art schools and museums by night while growing a successful graphic design career by day. At age 32 she met Robert Douglas Hunter, where she learned of the Boston School of Painters that led to training under Nadia Mahfuz for 7 years in the disciplines of 19thcentury French Academy. She then continued with workshops mentored by Sergio Roffo, Joseph McGurl, Tom Dunlay, and David Curtis. She also studied genre and portrait painting under the highly-esteemed master, Hongnian Zhang and wife, Lois Woolley, of New York where she continues to receive private mentoring.